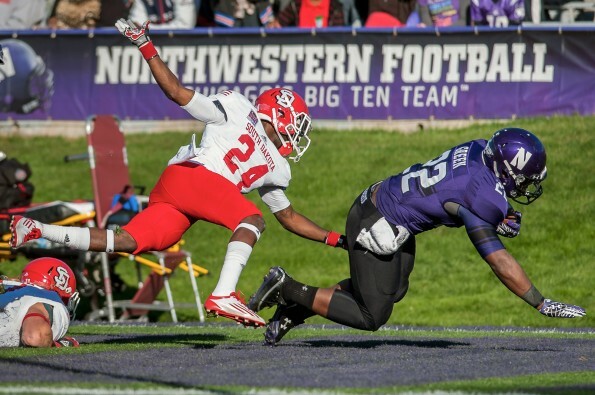 Junior running back Treyvon Green scored two touchdowns Saturday night, helping Northwestern overcome a quiet game from senior Venric Mark in the Wildcats' 44-30 win over Cal. BERKELEY, Calif. — After a back and forth battle, Northwestern held off Cal to win its season opener 44-30. Cal opened the game by running the ball all over NU’s defense. Junior running back Brendan Bigelow gained 55 yards on three consecutive plays in the Golden Bears’ first drive alone. Later in the opening series, Cal coach Sonny Dykes called a fake field goal, which resulted in senior kicker Vincenzo D’Amato throwing a touchdown pass to senior holder Jackson Bouza. NU responded with a touchdown of its own when junior running back Treyvon Green ran for a 33-yard touchdown to even the score. In the second quarter, junior quarterback Trevor Siemian connected with junior wide receiver Tony Jones for a 19-yard score, giving the Cats a 14-7 lead. The Cats and Bears would trade field goals later in the quarter and NU would go into halftime leading 17-10. After an NU field goal to open the third quarter, Cal’s offense started clicking. The Bears scored two quick touchdowns on passes of 52 and 7 yards from freshman quarterback Jared Goff to junior wide receiver Chris Harper. NU struck back on defense when junior linebacker Collin Ellis intercepted a pass and ran it back 56 yards for a touchdown to put the Cats ahead 27-24. Ellis would make another big defensive play in the fourth quarter when he returned a second Goff pass for a score, to give NU a 37-27 lead. The Cats iced the game when Green punched in a touchdown late in the fourth quarter to give NU a 14-point advantage. The injury bug bit NU all throughout the game. Senior quarterback Kain Colter left early in the first quarter with an upper-body injury and did not return. Junior cornerback Daniel Jones and freshman cornerback Matthew Harris were also injured in the first half and missed the remainder of the game.